We’re a couple of shooting stars, Biggs, and we’ll never be stopped. Lucas resides in Marin County. Lucas has said that he is a fan of Seth MacFarlane's hit TV show Family Guy. On June 12 1962 while driving his souped-up Autobianchi Bianchina another driver broadsided him flipping over his car nearly killing him causing him to lose interest in racing as a career. He founded Lucasfilm Limited and led the company as chairman and chief executive before selling it to The Walt Disney Company on October 30 2012. He is best known as the creator of the space opera franchise Star Wars and the archaeologist-adventurer character Indiana Jones. 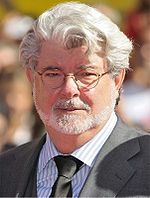 George Walton Lucas Jr.